The year two thousand and thirteen marks the bicentenary of Giuseppe Verdi’s birth, the composer described at his death as The Glory of Italy. In Part 1 of my Verdi Conspectus on this site (see review) I detailed the composer’s early life, how he came to write opera and how performances came about. I also surveyed the recordings extant at the time of writing. In all, there are twenty-eight titles in the Verdi operatic oeuvre. This includes the re-writes of two operas under different titles. 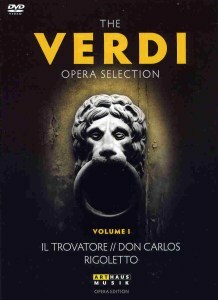 It is worth noting that a number of Verdi’s other works appear in different versions but carry the same title; this is particularly relevant to this collection in respect of Don Carlos as I outline below. This Arthaus setis one of the first such to hit the shelves and mark the bicentenary. The three operas chosen have little connection, spread as they are from the composer’s glorious middle period commencing with Rigoletto in 1851 and Il Trovatore two years later, to that nearing his final flowering which included Don Carlos of 1867. The sequence and recordings, alongside the composer’s wider life, is further extensively detailed in parts two, three and four of my conspectus. Whilst two of this collection emanate from performances at the Vienna State Opera there are no other connections, not even among the singing casts. However, as I outline in each review, they do illustrate something of the evolution in production styles that has occurred from the earliest, Il Trovatore recorded in 1978, to that of Rigoletto in 2006 via Don Carlos in 2004. Each has the distinctive hand of the stage director very much to the fore. The earliest operas available on visual media, VHS tape being one of the first, were most often films of stage or special productions. For these the lip sync was often all too obviously contrived. In the 1970s various broadcasting corporations aspired to relay live opera from a theatre to a wider audience. This process reached its epitome in live relays, in HD, broadcast to and available in cinemas around the world. Early examples were relays from New York’s Metropolitan Opera and RAI from La Scala opening nights. The present recording, from 1978, was all about capturing Von Karajan conducting one of his favourite operas on his return to Vienna. To be transmitted live, it was scheduled to be taken Europe-wide. As we know, there is many a slip between cup and lip. After the dress rehearsal, Franco Bonisolli the scheduled tenor walked out in a huff and all seemed lost. However, Karajan was in luck, Domingo was available and, prepared to travel. It was the perfect substitution. Even if the Austrian transmission was put back a few days and the pan-Europe schedule lost, a live transmission was achieved. Suffice to say of the performance that its qualities following its emergence on DVD stood it head and shoulders above later recorded contenders although I no longer believe that to be the case. Karajan chose his own stage designers as well as the television director, Günther Schneider-Siemssen. He himself directed the production. Looking at it thirty odd years after the event several matters date it, not least the décor and the frequent breaks for curtain calls at the end of scenes as well as each part (act). The periodic vociferous applause of the Viennese audience holds up the dramatic cohesion of the story after the popular solos. Fortunately the singers do not break role but wait impatiently to continue. Also rather dated is the fuzziness of the picture. There is neither the sharpness that we currently get with HD nor the immediacy of HD sound. The costumes are in-period and the sets are appropriate and atmospheric. Take the following as examples: the painted backdrops, the rails of the convent (CHs.20-22) and De Luna’s castle (CHs 34 et seq). Musically and in terms of singing the performance is outstanding. Domingo, the saviour of the day as Manrico, is in pristine lyric voice with plenty of power in reserve. His is a bravura performance vocally and in terms of his acting. He does not duck, or abbreviate the high notes of Ah si, ben mio and Di quella pira (CHs. 31-33). As Manrico’s supposed mother Azucena, Fiorenza Cossotto is absolutely fantastic in her acted and sung portrayal. I was fortunate to see her in this part a few years before this performance when, as here, she lived the role bringing every nuance, vocally and facially, to her interpretation. Her portrayal of Azucena in the two scenes in parts 2 and 4 are particularly notable (CHs.12-19 and 40-43). As De Luna, who covets Leonora, Pierro Cappuccilli is more committed than usual in his acting and vocal characterisation. He colours his tone and seems really to believe in the character. His phrasing, even tone and vocal colour are a strength throughout. His long-breathed phrasing and legato line in Il Balen are worth waiting for, not however, the over-long applause it elicits (CH.21). As the woman that Manrico and De Luna both love, the Bulgarian soprano Raina Kabaivanska is committed in her acting and floats some lovely notes in her two great solos (CHs. 5 and 35). However, I personally find her tone fluttery. She is certainly no match in lushness of production for Leontyne Price who sang in the production a year earlier and of which sound recordings exist. As Ferrando, the role that Caruso forgot when saying that Il Trovatore simple required the four best singers in the world, José van Dam brings presence and acted commitment albeit my personal preference is for the extra vocal sonority of a true bass. This is obviously an opera dear to Von Karajan’s heart. He knows it intimately. There are no over-indulgencies on his part and, a few small cuts apart, he does as full justice to Verdi’s creation as any other on record. The booklet refers to a Karajan interview during one of the intervals. This is not present on this DVD nor was it on the earlier two-disc manifestation (TDK. DVUS CLOPIT). More recently an HD recording from New York’s Metropolitan Opera on Blu-Ray has displaced this older one in my affections (see a colleague’s review). The tenor is good, but not in the Domingo class. The rest of the cast, Radvanovsky as Leonore, Hvorostovsky as Di Luna and Zajick as Azucena are good Verdians with the soprano particularly notable. With a major International Exhibition scheduled for Paris on the horizon, and Meyerbeer dead, Emile Perrin, director of the Paris Opéra, was desperate for a five act Grand Opera complete with the de rigueur ballet. With the helpful interventions of a mutual friend, Verdi committed himself to compose again for a theatre whose bureaucracy he abhorred. The agreed subject was Don Carlos based on Schiller’s poem. Verdi travelled to Paris in July 1866 and began composing. Schiller’s Don Carlos is long and so was the libretto to which Verdi composed the music. By February of 1867, as rehearsals for the first night were in full progress, it became obvious that the opera was too long for Parisians to catch their last trains home. Verdi reluctantly excised sections. This performance claims to be that which would have been presented at the premiere if Verdi had not been forced to make the excisions. At the Verdi Congress in Parma in 1969, David Rosen, an American scholar, produced a previously unknown section of the Philip-Posa duet that had been folded down in the conducting score prior to the premiere. The English musicologist Andrew Porter, acting on a hunch, visited the Paris Opéra library and asked to see the autograph score. He was amazed to discover that the pages of the music that Verdi omitted from the premiere, and subsequently thought to be lost, were simply stitched together. These excisions amount to about thirty minutes of music. They also give greater cohesion and logical explanation of the details of the complex story as the work unfolds. Porter copied out the missing parts. These were included in the first recording of the work in this complete form by the BBC in London on 22 April 1972; this recording was broadcast on 10 June 1973 and was much later issued on CD by Opera Rara (see review). Some of the missing music was also included as an appendix to the first studio recording of the French version conducted by Claudio Abbado (DG 415 316-2). Orfeo issued the sound track of this performance from Vienna on CD in 2005 (see review). Whilst not parading the quality of international names found in this and the parallel Orfeo recording, that from Opera Rara has the advantage of several singers for whom French is their first language and there are occasions when this is obvious to any francophone listener. Thus far I have commented on the generalities. On re-hearing, perhaps after the strained efforts of too many tenors heard in the Metropolitan Opera transmissions at my local cinema this past year, I find more grace of phrasing and tonal beauty in the singing of Ramon Vargas. Bo Skovhus, as his friend Rodrigue, looking quite silly with pony-tail and large specs, I find utterly unconvincing as a Verdian. Alastair Miles is more resonant than I allowed and suitably reflective in his supposedly lonely soliloquy Elle ne m’aime pas (DVD 2 CH.8). Of the ladies the Georgian soprano Iano Tamar as Elisabeth de Valois is distinctly better in the opening Fontainebleau act (DVD 1 CHs.3-9). However she seems to tire and struggle with the vocal demands of the big concluding act five aria, known in the Italian version as Tu che le vanita (DVD 2 Ch. 20). There I find her phrasing choppy and her expression limited. Nadja Michael has vocal resources to spare as Eboli. Hers is among the best Verdi voices in the cast. She uses her strengths to convey the many lyrical and dramatic facets the role demands and is reflected in the particularly warm applause that rewards her O don fatal et détesté (DVD 2 CH.14). As to the production and sets, the latter take little comment. Sparse is hardly the word. The whole is set in an open shoebox stage of white walls with innumerable doors. The doors might not be so bad if they were not so low as to require everyone leaving to have to duck down to exit. In neither the Fontainebleau scene, nor that in the Palace Garden, is there a tree in sight. There is some effort to portray the St Juste monastery with railings and a gate. It is the setting for the Auto da fé that stirs the most antipathy. Played in modern dress and starting in the foyer with announcements of Royal Entrances, it is a travesty. However, the scene is not alone in the latter respect. The ballet music is not played with dancers, but portrays Eboli and Carlos, as a married couple entertaining Philip and his Queen to dinner. Eboli burns the chicken and a pizza has to be summoned, delivered by pony-tail and silly specs Rodrigue himself. Then there is the mish-mash of costume, some scenes in period, others in modern dress as in the last scene (DVD 2 CHs.21-22) as well as the Auto da fé. However, the ultimate contradiction with the words of the opera comes as Philip rises from a futon, have bedded Eboli who is beside him, to sing of his loneliness and regret at Elisabeth not loving him (DVD 2 CH.8). Eboli is then present throughout the scene with the grand Inquisitor (CHs.9-10). At the end of the performance there is applause for the singers as well as general booing. Booing is also evident during the entrance to the Auto da fé. This takes place through the auditorium with the audience seeing what is going on outside in the foyer via a large screen above the stage. How De Billy on the rostrum keeps the whole thing together at this point I do not know. However, he is one of the few winners here, responsible for sensitive phrasing of the orchestra while supporting the singers as they strive with the demands of the French language and the director’s concept. Is all this worth it to hear the complete French version? My advice is to transfer the sound to a CD via your computer, if possible. Alternatively, buy the Orfeo version or that by Opera Rara. If you want a standard five act version in French, that is without the excised additions, then Pappano conducting from Paris in Luc Bondy’s production at the Théâtre du Châtelet in 1996 is a better bet. It has the advantage of a couple of francophone singers in the cast although you do not escape a silly haircut for Rodrigue (Warner DVD 0630-16318-2). There are several recommendable recordings of the Italian translation, as Don Carlo. However, it is worth remembering that each time that Verdi amended his score, as he did more than once, he composed to a French libretto commissioned for the task. The music and prosody of the original language are an essential consideration to achieve a true appreciation of Verdi’s creation. Strangely for one of the most popular of operas, even of those by Verdi, Rigoletto has not had a great record on DVD in recent years either by quantity or, more particularly, quality. That from Covent Garden, whilst having a rather perverse meccano-like set, is generally well sung and acted (Opus Arte OA 0830 D). That from the Gran Teatre del Liceu is marred by unsteady singing from Carlos Álvarez in the title role (see review). The Dresden production in 2008 involving Juan Diego Florez as the Duke was eagerly awaited. He is somewhat under-powered, and even lacking some vocal élan. The Gilda of Diana Damrau is outstanding with pure and even vocal production and characterisation along with a trill to die for in Caro nome. As her father,Zeljko Lucic lacks the dramatic vocal bite for this most demanding of all of Verdi’s baritone roles. Some of the production antics and costumes will be a deterrent to many (see review). So this production and cast from Zurich enters a not too competitive field of modern recordings in 16:9 aspect. In the title role, the sixty-four year old Leo Nucci could be considered a veteran. A favourite of Decca in the days of audio studio recordings, I always found his tone rather wiry and lacking in the vocal colour of the likes of his compatriot Cappuccilli. I could make a similar case in the case of his performance here. However, what tilts my opinion his way is his detailed and consummate acting and vocal nuance. His body language and facial expression, along with expressive vocalisation, are all that one could wish for in this most dramatic of baritone roles. Yes, there are moments of unsteadiness when he puts a shade too much pressure on his voice (CH.10), but in totality his interpretation is among the best, not least in the father and daughter scenes that are at the heart of Rigoletto as an opera of pathos and drama (CHs.11, 23 and 35). As his daughter Gilda, Elena Mosuc has a proud history in the most demanding of high coloratura roles such as The Queen of the Night in Mozart’s Magic Flute. Here her tone is womanly and her coloratura secure. However, she significantly mars her acted and sung contribution by returning to the balcony to acknowledge the applause after Caro Nome (CH.15), and then positively milks it, wholly ruining the dramatic effect of what has gone before. Piotr Beczala is a lyric voiced and handsome Duke. His singing is elegant in phrasing and variety of tonal colour. These vocal skills are paralleled by a convincingly acted portrayal as both the sincere suitor of Gilda (CHs. 13-14) as well as the egocentric master of his Court who pays unwelcome attention to Countess Ceprano (CH.4) and later dallies with Maddalena with seduction in mind (CHs. 30-31). Lasló Polgár is the most elegant Sparafucile I have ever seen portrayed with smooth sonority to match his appearance. This brings me to the matter of sets and costumes. Switzerland is not that far from Germany, the home of regietheater. Consequently I was more than surprised when the opening scene has Duke and courtiers in a location and in costumes of the period that Verdi envisaged and demanded. Rigoletto is the complete humpbacked jester sporting an appropriate hat and carrying his tricorn. That vision lasted to the end of the first scene after Monterone, with grey beard, had come and gone leaving Rigoletto cowering at his curse (CH.8). When the jester meets Sparafucile on his way home to his daughter all has changed (CH.10). Costumes have moved on a few centuries, late nineteenth century at a guess. Both father and assassin have rolled and curved brims to their bowler hats and the street scene would be suitable for a Jack the Ripper scenario with high brick walls and a dingy ambience. Rigoletto’s home emerges from the large double doors in the wall near the meeting with Sparafucile. Rigoletto is met by his daughter who wants to know more about her mother and the town where they are (CHs. 11-13). He fears any intrusion that might put the young girl in danger. The home is decorated in the same late nineteenth century period as the costumes. The final act is set with an atmospheric waterfront backing with Sparafucile’s inn represented by trestle tables and a staircase to the rooms available for the more nefarious side of his business. Like the set for the end of act one, and that for act two in the Count’s room, it works. The manner of the sack containing the body being passed from assassin to father also works, as does Rigoletto’s discovery that it is his daughter not the Duke. This is accomplished with full assistance from Nucci’s convincing acting and sung portrayal. Overall a convincingly sung and acted interpretation with a mixture of periods for set and costume. It’s all helped by imaginative direction and the singing of the principals. The gimmicks and rudimentary set of the Don Carlos are a world away. It is a pity about Katharina Peetz breaking role though. The vastly experienced Nello Santi, conducting without a score and towering above the orchestra, perhaps did not help that situation by joining in audience applause. Otherwise, his conducting helped the singers to maximise their respective vocal accomplishments to the full while doing justice to Verdi’s magnificent creation.